PT Bank Pembangunan Daerah Sumatera Utara - Bank Sumut is a rapid growing regional development bank in Indonesia, based in Medan North Sumatera. Bank Sumut is owned by North Sumatra Provincial Government and Cities/Regencies Government in the North Sumatra Province. As of December 2015, Bank Sumut runs its business through 34 conventional branch offices, 5 sharia branch offices, 99 conventional sub branch offices, 17 sharia sub branch offices, 31 cash offices, 27 mobile cash units, 59 SAMSAT Payment Points, and 239 ATM units. 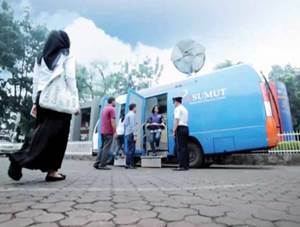 In 2015, Bank Sumut continues to deliver a strong performance. As of 31 December 2015, Bank Sumut’s total assets was at Rp 24,130 billion. That number is up 3.14% year-on-year from Rp 23,395 billion in 2014. Total income in 2015 was at Rp 3,477 billion or 17.50% higher than Rp 2,959 billion in 2014, according to PT Bank Pembangunan Daerah Sumatera Utara Annual Report 2015 as cited by JobsCDC.com. Male / Female (in accordance with the proposed formation). Preferably have proficiency in spoken and written English. Able to operate computer minimal Microsoft Office. Willing to undergo Association Office. Willing to be placed throughout the working area of PT Bank SUMUT. Not being lodged criminal cases and / or are undergoing the process of criminal justice. Male, not exceed 25 years of age for fresh graduate and 27 for experienced by 1 December 2016. Minimum S1 from all the majors, except for fields of study Midwifery, Health / Nursing, Literature, Art and Religion. A minimum final GPA of 2.75 (PTN/PTS accreditation minimum B). Minimum height of 160 cm. Not married and not to get married during the education period or not yet appointed an employee. Male or Female, not exceed 25 years of age for fresh graduate and 27 for experienced by 1 December 2016. Attractive, weight and height proportional. Minimum D3 from all the majors, except for fields of study Midwifery, Health / Nursing, Literature, Art and Religion. Minimum height of 170 cm (Male) and 165 cm (Female). Male, not exceed 30 years of age by 1 December 2016. Minimum S1 majoring in Economics, Law and Engineering. A minimum final GPA of 2.75 for PTN or 3.00 for PTS (minimum accreditation "B"). Minimum 4 years of experience in banking industry or finance (previous experience as a credit analyst is preferred). Able to work with the target system. Minimum TOEFL score of 450. Possess certification in Risk Management (minimum level 1) is preferred. Minimum S1 majoring in Economics, Law, Sharia Economics and Engineering. Minimum 4 years of experience in banking industry or finance (previous experience in sharia banking is preferred). Male, not exceed 45 years of age by 1 December 2016. Minimum 5 years of experience in banking industry or finance (previous experience in sharia banking is preferred) and served as Manager. Have a good negotiation and selling skills. Possess certification in Risk Management (minimum level 1). Minimum 5 years of experience in banking industry or finance (previous experience in sharia banking is preferred) and served as Section leader. Male, not exceed 35 years of age by 1 December 2016. Minimum 3 years of experience in banking industry or finance (previous experience in sharia banking is preferred). Special for P2R staff P2R (penyelamatan pembiayaan dan restrukturisasi) have experience in the field of banking auction. Have experience in the field of banking IT. Minimum 3 years of experience in banking industry (previous experience in sharia banking is preferred). JobsCDC.com now available on android device. Download now on Google Play here. Please be aware of recruitment fraud. The entire stage of this selection process is free of charge. Bank Sumut - Management Trainee, ODP, Pro Hire Syariah Bank Sumut January 2017 will never ask for fees or upfront payments for any purposes during the recruitment process such as transportation and accommodation.